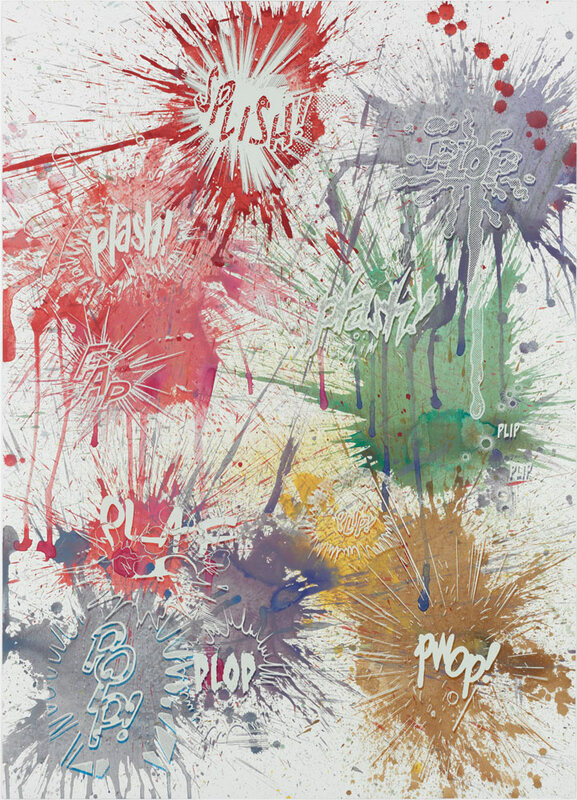 Christian Marclay, Actions: Splish, Plop, Plash, Plash (No. 4) (2015), screenprint with handpainted acrylic, 49 x 35 inches. 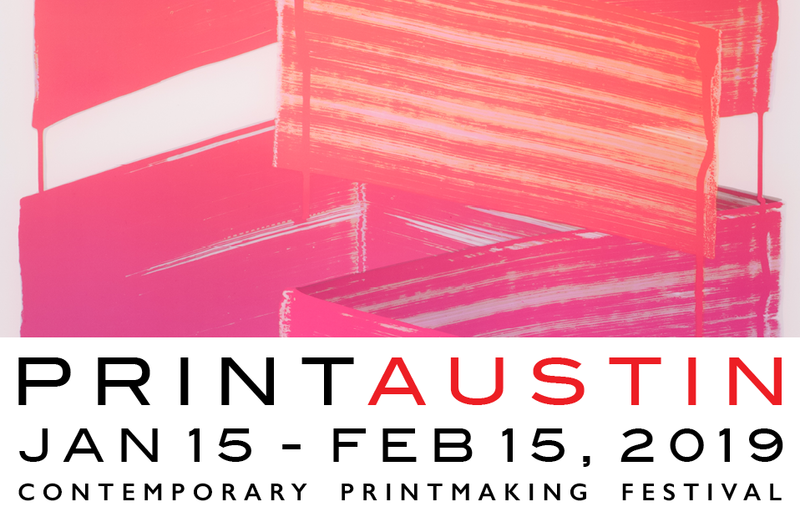 Image courtesy of the artist and USF Graphicstudio ©2015. Photo: Will Lytch. Foucault was, at that moment, concerned with the 17th century, but the mismatch he articulates is universal—an ineluctable ellipse between two endeavors, both seductive, both lit independently with the promise of meaning. Contemporary art has spent the last half-century scrutinizing that ellipse with the tenacity of a dog worrying a bone, and not only with words and canvas. If “painting” can be understood as a metonym for visual art in general, and music can be considered a “language” (aural information unfolding over time), then Christian Marclay may be the artist of the “infinite relation” par excellence. Christian Marclay, from Sound Holes (2007), suite of 21 photogravures in a clamshell box, image 9 x 7 inches each, sheet 13 1/4”x 11 inches each. Edition of 12. Image courtesy of the artist and USF Graphicstudio ©2007. Photo: Will Lytch. When vinyl became less commonplace, Marclay turned his attention to cassette tapes, CDs, loudspeakers, musical instruments and their empty cases. This preoccupation with pictured sound might have become limited and repetitive, an iconographic one-shtick pony, but Marclay has built it into a poetic, droll and occasionally bruising meditation on time and all our beautiful and futile attempts to fix it. Though often described as a “sound artist,” Marclay has never focused on the phenomenological presence of sound in space in the manner of Maryanne Amacher or Alvin Lucier. It is the things we confuse with sound that fascinate him—the recordings, the notation, the packaging, the devices that pretend to give solid and immutable substance to fleeting experience. Using a camera, Marclay has compiled a vast pictorial encyclopedia of objects that ask us to hear with our eyes: musical staves on blackboards and deodorant tubes, biceps tattooed with quarter notes, wrought-iron G-clefs. 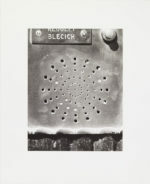 His 2007 portfolio of photogravures, Sound Holes, documents the perforated metal sunbursts, snowflakes and Chinese Checkers patterns of intercom systems. 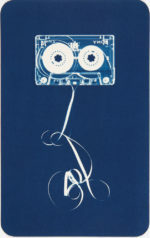 Christian Marclay, Memento (Prince) (2008), unique cyanotype, 51 1/2 x 97 3/4 inches. Image courtesy of the artist and USF Graphicstudio ©2008. Photo: Will Lytch. Photography’s job is to freeze the moment, and in that sense it is the opposite of music, which can be experienced only by the trickling away of seconds. The nesting of such contradictions is exactly what Marclay does so well. 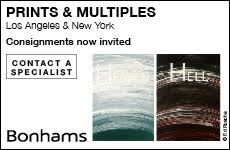 His photographic editions Graffiti Composition (2002),3 Shuffle (2007)4 and Ephemera (2009)5 are also musical scores. Each picture provides a set scene and also a playable motif that can be unfolded, mixed and sequenced by the user—unfrozen and returned, as it were, to time. There is a reason that Shakespeare had Macbeth frame the futility of existence in terms of sound.6 The allure of objects—silent and stalwart—is that they endure, but sound decays, comes to an end, gives way to the void. Implicit in much of Marclay’s earlier work, this trade-off has become increasingly visible over the past decade, beginning with his 2006 screenprints, based on Andy Warhol’s first Electric Chair paintings (1964–65).7 Marclay’s versions dispensed with the chair and most of the room, preserving only a door and its plangent sign: SILENCE. It is a part of the composition that Warhol himself eliminated when he returned to the subject in 1967 and cropped the image more tightly. 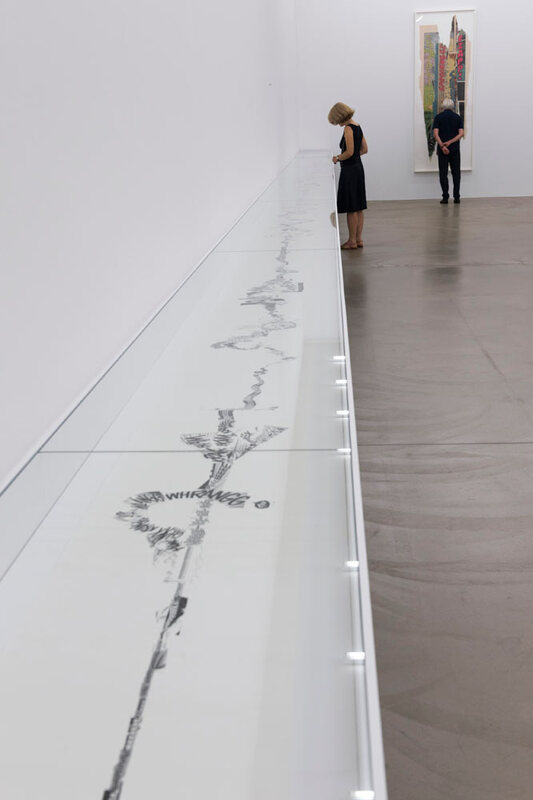 For viewers who can identify the chain of citations (Marclay to Warhol to the execution chamber at Sing Sing), the presence of death is explicit, but even without footnotes, the word and its grainy delivery intimate loss and terror. 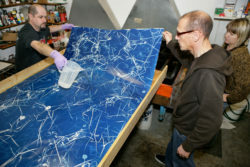 Christian Marclay (center) producing a unique cyanotype at Graphicstudio, University of South Florida, Tampa. Image courtesy of USF Graphicstudio. Photo: Will Lytch. In 2008 Marclay returned to the Florida workshop where he had made his Sound Hole photogravures, Graphicstudio, to work with cyanotype. One of the earliest techniques for a direct photographic exposure (no camera, no negative), cyanotype was developed in the 1840s to duplicate drawn designs like architectural blueprints. Its potential for fixing evanescent botanical specimens was, however, quickly recognized by Anna Atkins, whose 1843 Photographs of British Algae: Cyanotype Impressions is thought to be the first photographically illustrated book. 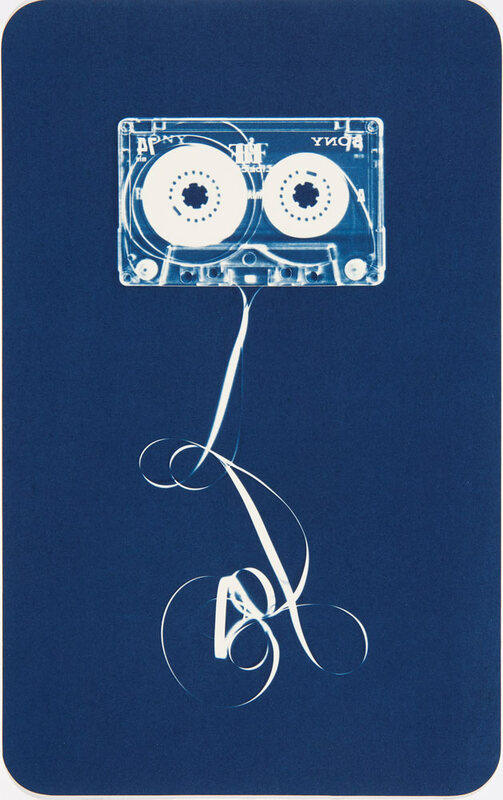 Marclay’s specimens were cassette tapes. Each of his 35 Automatic Drawings (2008) is an individual portrait of a Sony cassette disgorging a loop of tape. (Because there is no negative, each impression is unique.) The clear plastic case produced a nimbus-like glow, and it is almost impossible not to read the spools as eyes and the lolling twist of tape as an elaborate tongue. The curls resemble the ovoid loops produced by wrists freed from conscious control, and Marclay’s title points to Surrealist automatism, but other associations are equally compelling. The tape’s seemingly organic wiggle evokes Atkins’s algae, and the medium itself inevitably recalls the blueprints that Robert Rauschenberg and Susan Weil made between 1949 and 1951—works that constitute as good a marker as any for the mid-century paradigm shift away from expressionism and toward the stuff-in-the-world concerns of everything since. 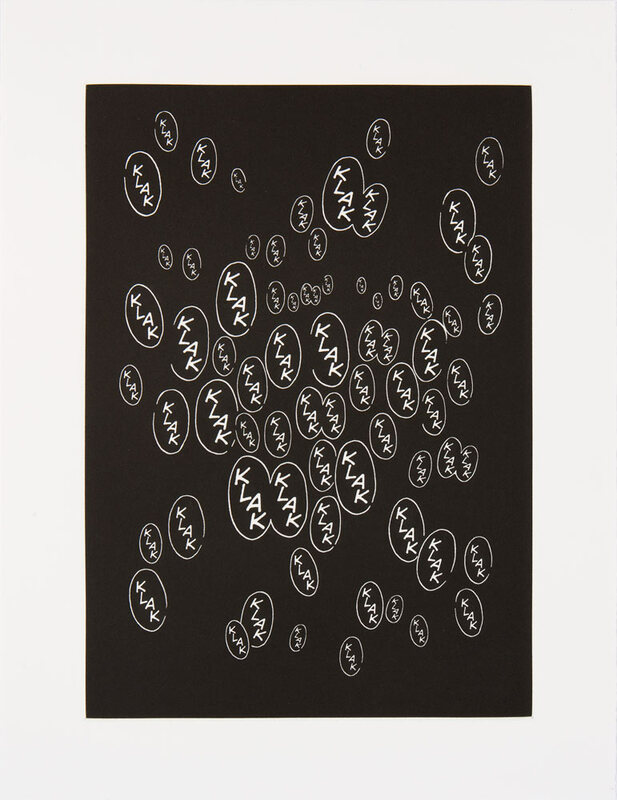 Christian Marclay, Automatic Drawing (2008), cyanotype, 12 x 7 1/2 inches. Graphicstudio proof. Image courtesy of the artist and USF Graphicstudio ©2008. Photo: Will Lytch. 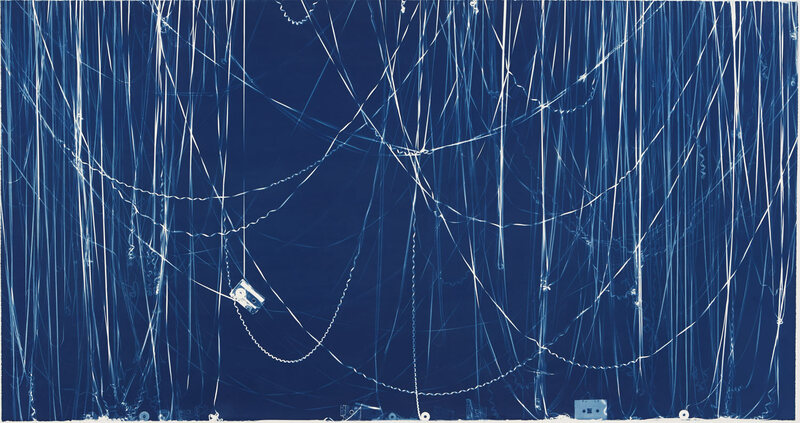 Marclay, however, approached cyanotype on an unprecedented scale: over the course of two years he created works in six compositional series,8 the largest more than eight feet long. While Graphicstudio had some experience with the medium, the size and specifics of Marclay’s project presented new challenges, and Tampa’s climate created further complications—the heat of the sun would cause the tape to move unexpectedly, while the humidity meant prepared papers had to be used within the day. On the other hand, the 15–20-minute exposure times meant Marclay could drape, rake and swirl miles of disemboweled quarter-inch tape, adding and removing elements, much as an etcher might add or stop out lines on a plate to vary the strength of different lines, producing images of subtle, subaquatic depth. 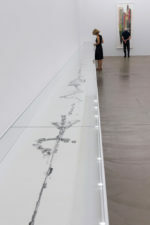 Installation view of Manga Scroll (2010) at “Christian Marclay. Action,” Aargauer Kunsthaus, Aarau, 30 August–15 November 2015. Photo: René Rötheli, Baden. Cassettes, like LPs, were once handy metonyms for music, but they never had the same expansive confidence—there was always something a little mean, a little sad, a little “seventies” about them. A black vinyl disk outside its sleeve is iconic, but the spilled guts of a cassette are mildly indecent—a sign that things have gone badly wrong. The power of Marclay’s cyanotypes is closely wrapped with this slightly abject, slightly tragic character. Their one-to-one scale prompts us to identify instantly the material that formed these ribbons of light, to recognize the destruction they represent, to understand their lost promise as music. 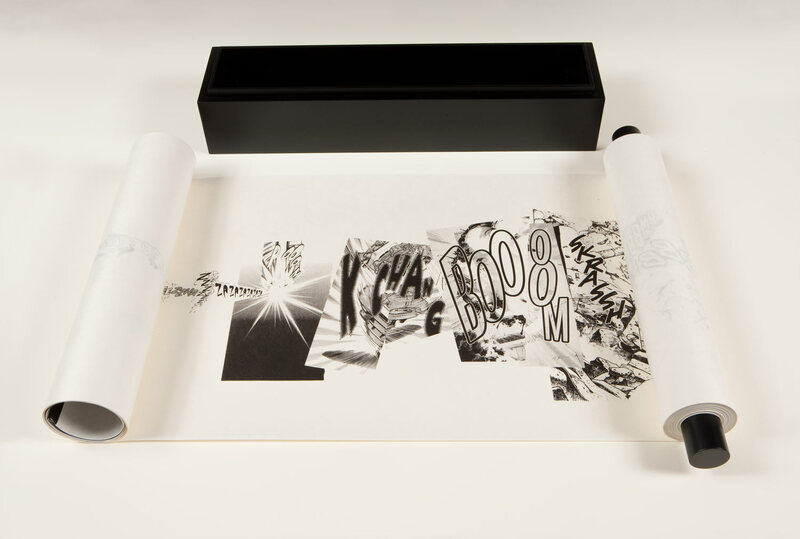 Christian Marclay, Manga Scroll (2010), lithography on Gampi paper, sheet 16 x 787 1/2 inches, scroll 19 x 3 x 3 inches, box 20 3/4 x 5 x 5 1/8 inches. Image courtesy of the artist and USF Graphicstudio ©2010. Photo: Will Lytch. In the Memento cyanotypes, shattered cassette boxes litter the bottom while tape droops in bedraggled catenaries from the upper edge like party streamers the morning after—the relics of a disco-era Miss Havisham. In the Allover series he removed gravity from the equation, scattering tape across the prone paper in layers that suggest nebulae, neural ganglia, or, as per the title, the “allover” paintings of Jackson Pollock. 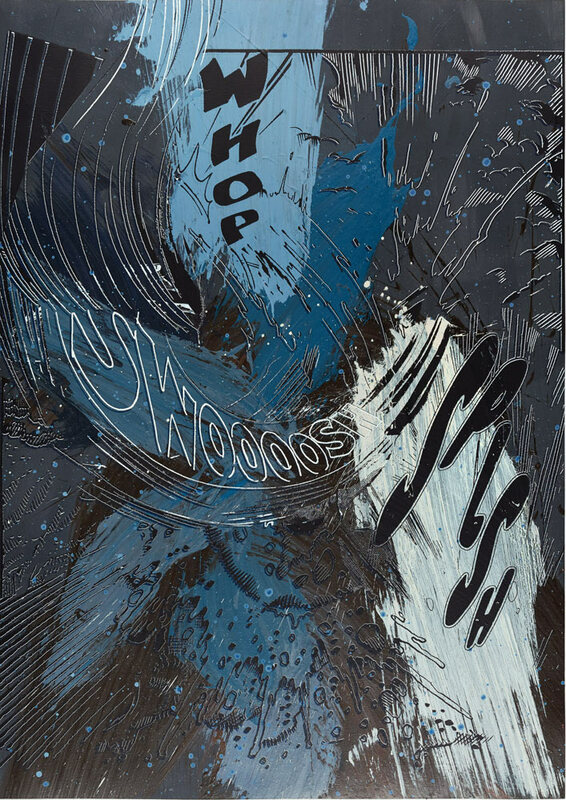 Christian Marclay, Actions: Whop SwooooshSplsh (No. 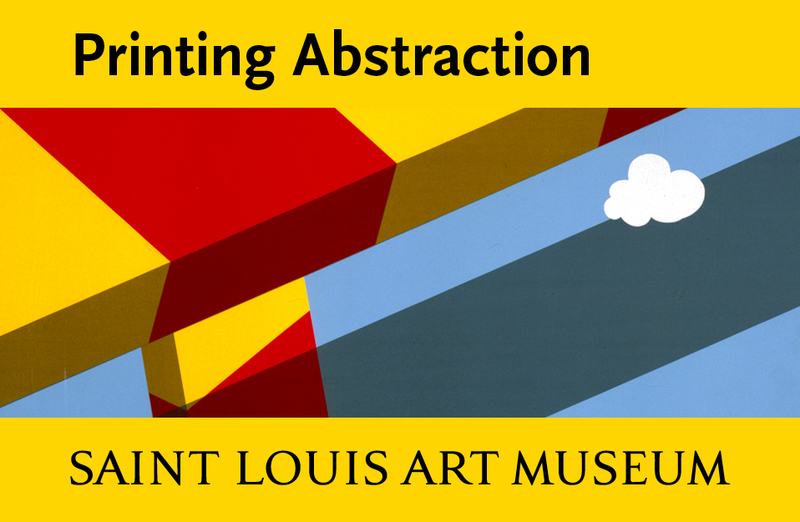 8) (2012), screenprint with hand-painted acrylic, 34 7/8 x 49 1/8 inches. Image courtesy of the artist and USF Graphicstudio ©2012. Photo: Will Lytch. 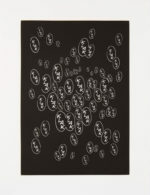 Action has since emerged as the stated subject of Marclay’s collages, gravures, scrolls and screenprint paintings. In them, the deep silence of the cyanotypes gives way to sound and fury—the jagged letterforms and massed exclamation points of comic book onomatopoeia.11 Manga Scroll (2010) is a 60-foot-long rolling torrent of cartoon verbiage that, like so many of Marclay’s prints, also functions as a musical score.12 The swelling or attenuation of letter blocks, their boldness or fragility, offer performance instructions as clearly as any pianissimo marking. The comics artists who drew these noises were striving for instantaneous impact, and yet onomatopoeia has never been a universal language—not only do writing systems and spelling conventions vary, the aural experience of particular events seems to differ from culture to culture: a drinking dog goes “glup” in Finland, but “lefety lefety” in Hungary.13 For Marclay, slippage, rather than transparency, is the point. The words were cut from American editions of Japanese manga: each POING and KBLOOSH represents a sound heard, transliterated, calligraphed and printed; then translated, redrawn and printed again; then clipped, collaged, digitally trimmed and printed a third time, in order to be read and translated—finally—back into sounds in time and space. Manga Scroll and the large hanging scrolls that followed14 contrast the quietude of traditional Japanese aesthetics with the brashness of Japan’s most popular contemporary cultural export. His manga photogravures do something similar to the Western graphic tradition. The implicit dignity of intaglio endows these excitedly silly syllables with an unexpected elegance and authority. 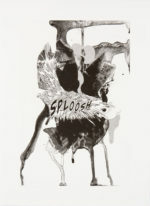 In SPLOOSH (2012), the title word explodes at the center of the page in expected style, but the irregular blob that sits behind it has none of the linear precision of a cartoon; instead it suggests a beautifully etched liquid mess—the aftermath of a SPLOOSH, rather than its schematic representation. Three modes of explanation are abutted here—the word, the drawing, and the trace—all shouting “action” in perfect stillness. 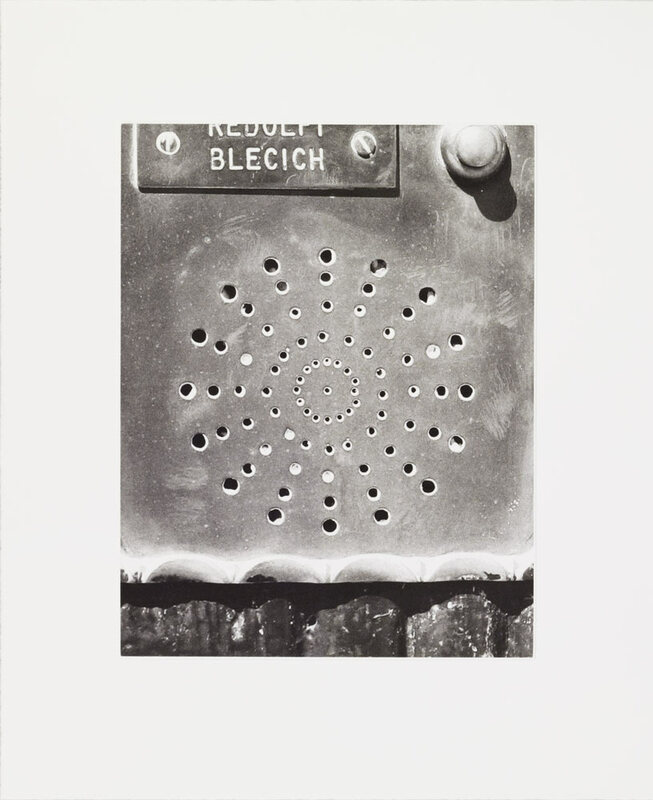 Christian Marclay, Klak Klak Klak (2012), photogravure, image 11 11/16 x 8 1/8 inches, sheet 14 9/16 x 11 1/16 inches. Edition of 25. Image courtesy of the artist and USF Graphicstudio ©2012. Photo: Will Lytch. This pairing of an action’s result with the graphic rendering of its sound provides the structure for the screenprint paintings that Marclay has been making since 2013 with Graphicstudio and Coriander Studio in London. 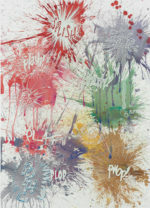 Cartoon onomatopoeias of liquid sounds—the splats and slups that might accompany the action of action painting—are printed overtop canvas or paper that has been splashed with paint. The result is, of course, funny—the wiseacre visual language of Pop defusing the metaphysical pretensions of Abstract Expressionism. Marclay describes them as “parodies of painting,” but goes on to point out, “they have to be beautiful or work visually. I think the idea of beauty and parody can coexist.” And unlike the carefully delineated Brushstroke paintings of Roy Lichtenstein, the joke here is tethered to a real event. The paint really did go sploosh; there was a moment when Marclay stood a few feet away and made that happen. The forensic evidence is as plain to see as a blood splatter. First shown at Paula Cooper in 2013, these works anchored “Liquids,” Marclay’s 2015 exhibition at White Cube in London. 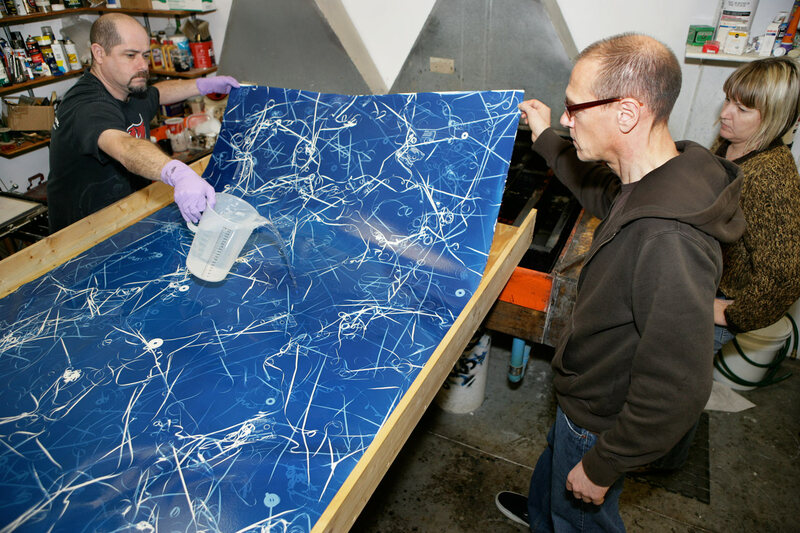 “Liquids” also incorporated onomatopoeic videos, a live concert series, an on-site record-pressing plant that could transform the concert into vinyl before your eyes, and screenprinters live-printing record jackets. (Though the art on the walls was out of reach for most buyers, the records could be had for just £25.) Here, it would seem, you had it all—actions and experiences recorded, processed, stamped, adorned. Each stage was duly marked and yet, in the end, time disappeared anyway. 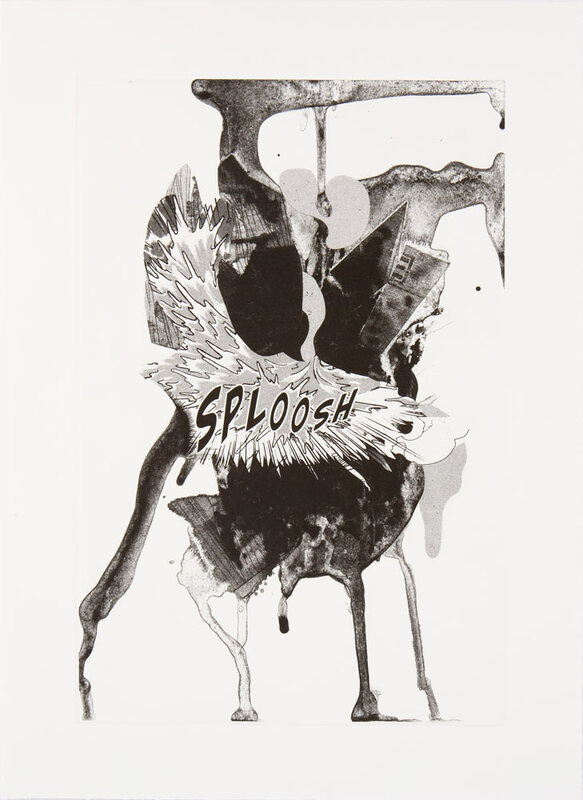 Christian Marclay, Sploosh (2012), photogravure, 15 3/4 x 11 5/8 inches. Edition of 10. Image courtesy of the artist and USF Graphicstudio ©2012. Photo: Will Lytch. Time—regulated, standardized, tick-tock time—is the subject of Marclay’s most famous work, the 24-hour video installation, The Clock (2010), which won the Venice Biennale’s Golden Lion award and has made Marclay something of a museum-going-household name. Composed of more than 12,000 film clips marking every minute of the day, The Clock is hypnotic, exhausting and exhilarating in its scale, in a way no static object—however wrapped in the sublime—can be.